Thank you so much to Penguin Australia for sending me a copy of Archenemies by Marissa Meyer in exchange for an honest review. Receiving a copy in no way impacted my thoughts and feelings for this book. I love Marissa Meyer. All her books – with the exception of Heartless – have been an absolute hit for me. The Renegades series has proven no different to this. I fell in love with the first book, flew through it so damn quick and was so happy to have received a review copy. Renegades was one of my favourite books of 2017 and I was highly anticipating Archenemies. I am so glad to say that Archenemies was so worth the hype and lived up to my own personal hype. I was stressed that my hype may ruin it. The whole superhero plot line isn’t utilised enough. There are so many stories to be told within this kind of setting and Marissa Meyer is utilising that. Her characters jump off the page. This super hero story focuses on the ideas of good and bad, what makes something bad and good? Can people who are labelled good still do bad things? Additionally, should people have the powers that they possess? Where do the lines become drawn? It is such a debate of the moral grounds throughout this book that is subtly woven in. It is such an interesting approach to take and makes it so much more interesting to read. Which is incredibly important considering this is a large book. If it was boring I think I would have gone partially wild. Archenemies follows both Nova and Adrian again, I did feel that there was more of a focus on Nova throughout this book so if you enjoyed her in Renegades you’ll be even more excited for this one. Nova and Adrian are still harbouring their secrets which could destroy their entire worlds. The secrets are both their protection and what drives this story forward. It can be a tad annoying in places, due to the fact that it can all be dwindled down to miscommunication. However, this story had a strong thread of romance. Renegades was lacking in the romance, which I think did make it so good. However, this book really started to interweave Nova and Adrian together romantically. Nova was also so damn relatable in terms of her feelings which she shouldn’t have. Trying to work out her romantic feelings for Adrian (are they real or just part of her plan?) and her love for her family. As well as Adrian dealing with his secrets while also was being oblivious to Nova’s blatant flirting. Archenemies also had an amazing amount of backstory. We got to know characters like Honey, what made her into the villain? How did she get her superpowers? I truly hope there is more of it in the third book because I thrive on backstories. I think one of my favourite things about Archenemies was getting to see more of Max and having him as a central part of the plot. I am sure that everything we learnt in this book will come back in to play in the third book. Max was truly a beacon of light in this book – which is what I always find children to be in books like this. I found him such a damn sweetheart and for some reason I have no idea how old he actually is? Marissa Meyer has a talent for action scenes and that is highlighted in Archenemies from the opening scene. I am not someone who typically enjoys fight scenes, my eyes tend to glaze over and my brain dies. However, Archenemies did it so damn marvellously that I was anxiously on the edge of my seat to see what would come next. The dynamics within this book are incredibly beautiful as well. The whole basis is family. Whether that be for the archenemies or heroes. Each group has developed a family and it warmed my heart. Each family is also morally grey which was incredibly well done because damn, accurate. The story really didn’t have to go that hard but it did. I am incredibly impressed. 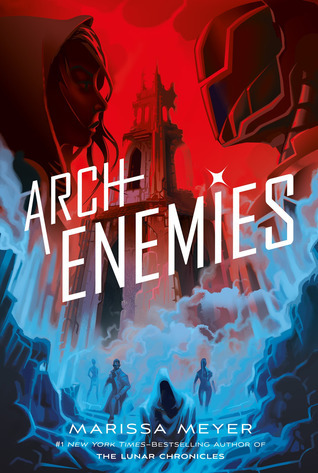 There is so much to say about Archenemies but I am struggling to put most of it in to words due to the fact this is a sequel. I mean, how do I tell you about everything I want to if I don’t know if you’ve read the first one? Plus, I try to keep my reviews as spoiler free as possible. Overall, Archenemies is yet another hit for Marissa Meyer. I am so glad that I was able to receive a review copy to read. The story has endless layers and is worth your time. I really hope this review convinces y’all to pick up this series if you haven’t, especially since today is release day in Australia! Have you read Renegades? Are you looking forward to Archenemies? Tell me in the comments! I’m glad you enjoyed this! So lovely to hear about the focus on family. I’m not sure when I’ll get to this but hopefully soon since I did enjoy book one. I cannot wait to read Renegades! I hope you really enjoy it! It’s a great series!